The image depicts the Nun Hroswitha of Gandersheim (ca. 932–1001) presenting her six plays to Emperor Otto I, in the presence of her niece, Gerberga. Bibliography: Joseph Meder 243; Arthur M. Hind 243. 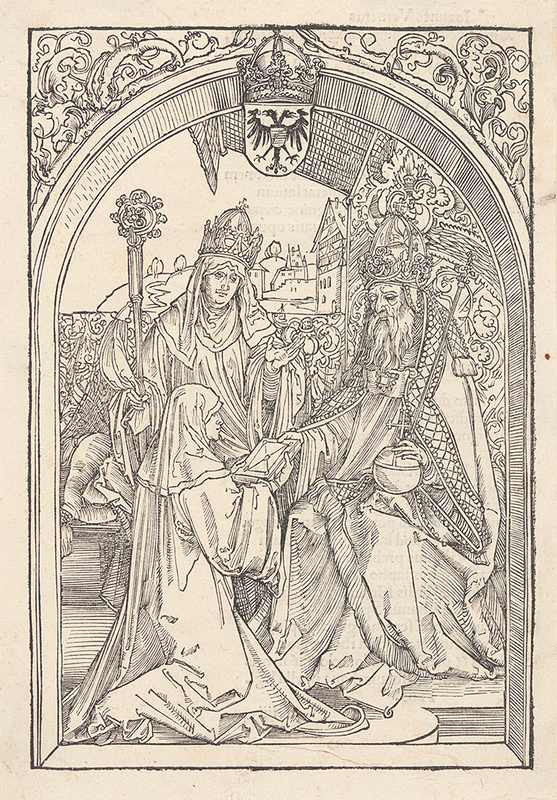 The Nun Hroswitha of Gandersheim Presenting Her Six Plays to Emperor Otto I, in the Presence of Her Niece, Gerberga, . From Opera. Woodcut. DAC accession number 1964.38.6. Purchase funds, 1964. Open Access Image from the Davison Art Center, Wesleyan University (photo: R. Lee). http://dac-collection.wesleyan.edu/obj5095 is a persistent link to this page with no user-session information.